A Fence is an object found in various Mario games, such as Super Mario World and New Super Mario Bros. Artwork of Mario clinging to a fence. Two Fences in Super Mario World: Super Mario Advance 2. In Super Mario World, Fences occasionally appear in Castles. Mario or Luigi can jump on, climb on, and jump off of them to go around traps like Lava. The brothers can also flip to the other side by punching a square panel. Climbing Koopas are commonly found to be climbing on Fences, and they are capable of climbing around both sides of the fence. The brothers may punch the Climbing Koopas that are on the other side to defeat them. Fences in Super Mario Sunshine. In Super Mario Sunshine, Fences can be used the same way. Many of the fences take the form of boxes which enclose enemies and coins, although some are traditionally flat. Fences appear in Ricco Harbor, Pinna Park and Pianta Village and can be used to knock off enemies from the other side. Fences in New Super Mario Bros.. Fences appear again in New Super Mario Bros. in World 3- and World 4- , being the principal feature of both levels. Fences in New Super Mario Bros. Wii. 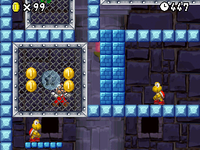 Fences reappear in New Super Mario Bros. Wii as obstacles in Towers and Castles, similar to Super Mario World. Certain areas are inaccessible unless the player switch to the other side of the fence, via the revolving gate. There is also a special type of Fence which can be rotated 90 degrees left or right by the first player who climbs the fence by tilting the Wii Remote left or right. Also, a yellow Fence is used in the Power-up Panels minigame. Fences in New Super Mario Bros. 2. 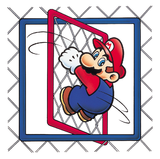 Fences also reappear in New Super Mario Bros. 2, along with other special types of Fences introduced in the game. In World 5- , there are large Fences made up of smaller Fences that move upwards along with the rising lava and, at certain points, rotate. They are required to progress through most of the level. In World 5-Castle, there are Fences that move along a wire once the player climbs them, and can be changed to move above or below the wire by pressing / . The revolving gates are absent. Fences in New Super Mario Bros. U. Fences appear once again in the Wii U game New Super Mario Bros. U with the same design as in Super Mario World, with red borders instead of gray. Unlike in other games, however, the player cannot punch on the fences. The revolving gates are absent once more. A small Fence makes a brief appearance as an obstacle in Neon Castle in the Super Mario World animated series episode "Mama Luigi". Mario, Luigi and Yoshi are able to easily pass this gate by simply using its revolving door. Fences in Mario Party 9. 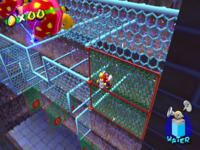 In Mario Party 9, a fence appears in the Bowser Jr. minigame, Cage Match. They are used in the same way as in New Super Mario Bros. Wii. ↑ Shogakukan. 2015. Super Mario Bros. Hyakka: Nintendo Kōshiki Guidebook, page 105. This page was last edited on March 22, 2019, at 15:31.